October | 2008 | Ipoh Mali Talak Sombong! Sorry for the long hiatus, was busy with gym and another freelance web project for a friend lately. Both of them have been draining my time and energy for the past few weeks and I finally got the time to edit some pictures yesterday and put this up. This happened almost 3 months ago, when Calvin, me, Janvier, Chief and David went down to Klang on one fine Sunday morning for BKT. Both Calvin and Janvier personally hailed from Klang (but working in PJ), so it wasn’t difficult for us to get around in Klang. According to them, Klang town centre is having a major construction project so it would be good to avoid that part. 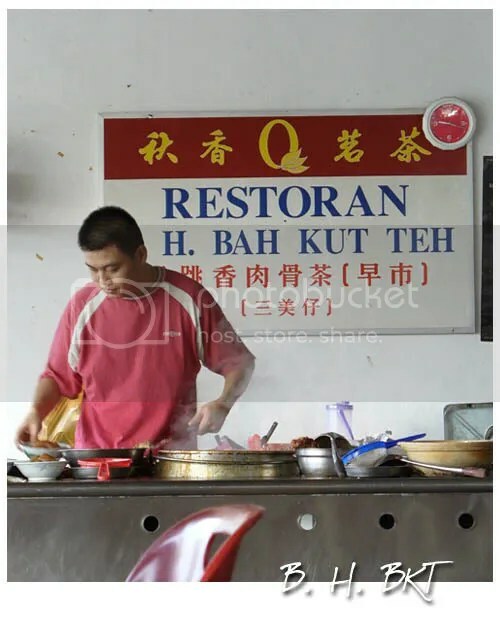 Lucky for us, the particular BKT place that Calvin suggested was in Pandamaran, somewhere nearby Bukit Tinggi which can be reach by taking the Kesas Highway. Also, according to Calvin, the place is packed and normally the BKT will be sold out by 9.30am, so it is advisable to go really early (just look at the crowd!). 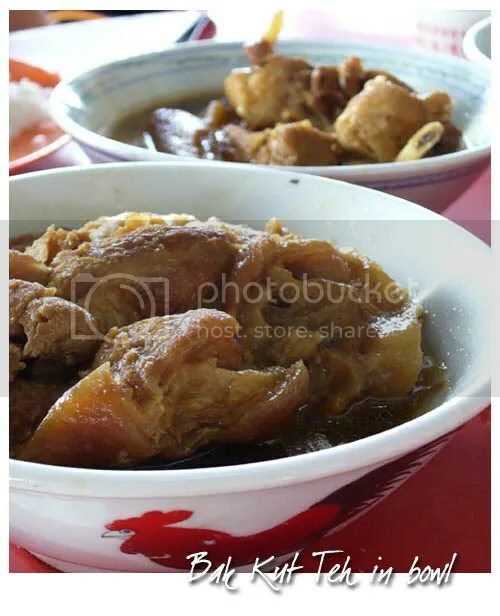 The version of BKT served here were different from the usual claypot style. Served in an individual bowl, it doesn’t consist of tau fu pok and doesn’t served together with fried crullers (yau char kuey). The herbal taste is very mild and not much broth were given. The pork chunks, however, were really tender despite the size. You can choose to have only the lean meat or half-lean, half-fat. 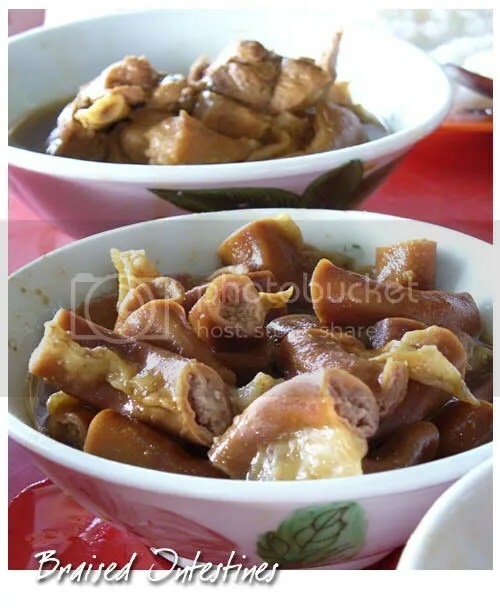 Also available here is the braised pig intestines, served in the same broth of BKT. I’m not a fan of internal organs but the rest seems to enjoy it. I normally see intestines were hollowed but this one, it seems like they stuffed something else into the intestines before being cooked. Direction: If you take the Kesas Highway after Sunway toll, exit to Klang and you will reach Aeon Bukit Tinggi. Go straight, go up the flyover and turn left immediately after the flyover. 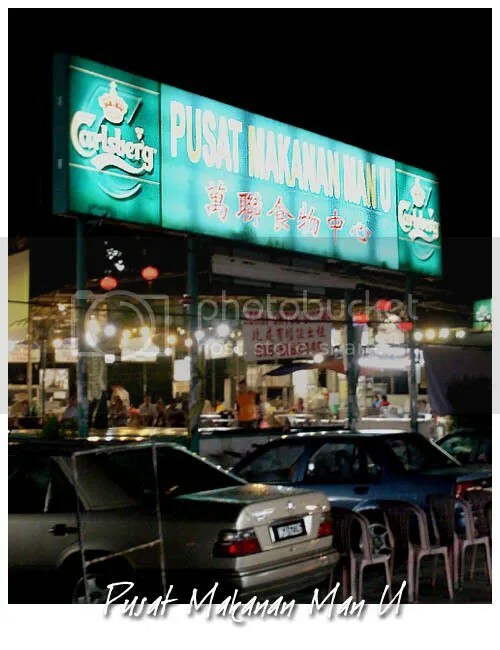 Go straight and you will see this place before the Perodua service centre, in front of the traffic light on your left. 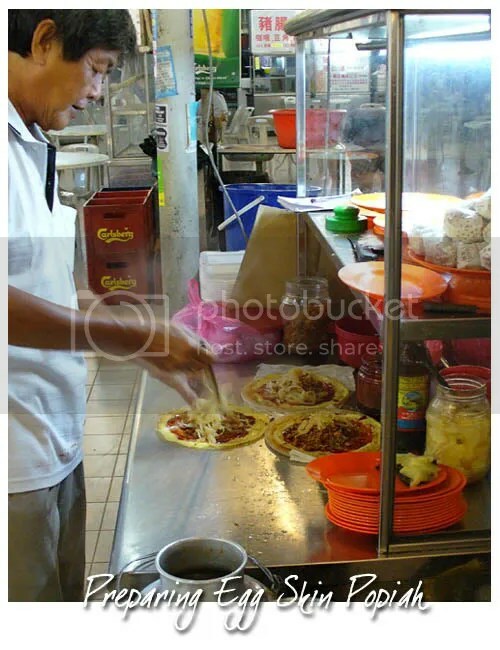 *Notice: The egg popiah shown here is no longer available as Mr. Wong, the proprietor has decided to retire some time back. Gary drop by Ipoh two months ago with his mom while on their way back from Penang to KL and stayed overnight. 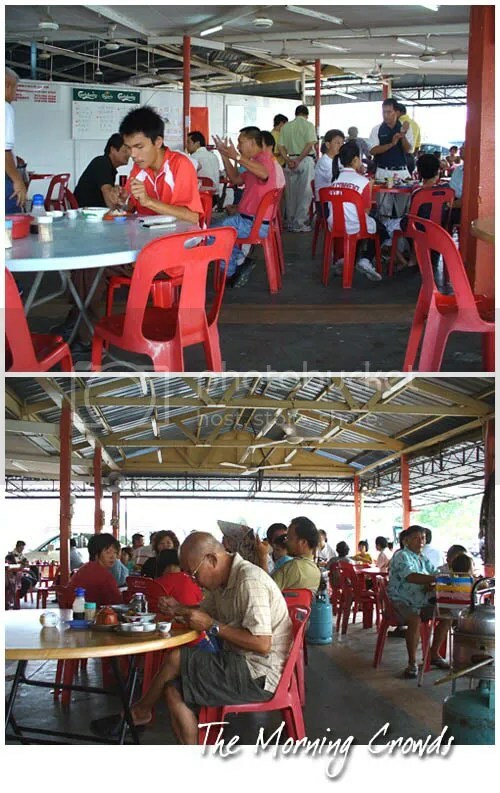 Me too, was in Ipoh that time so I brought him out for a spin and then yam cha at my favourite place, Tong Sui Kai. My favourite popiah stall is located inside this food court, which is just opposite the stretch of hawker stalls at the street called Man U (I assume that it means Manchester United since the live football telecast is always on here). SC tried to find this place during her last visit but failed, while WMW finally able to make her way here last August. 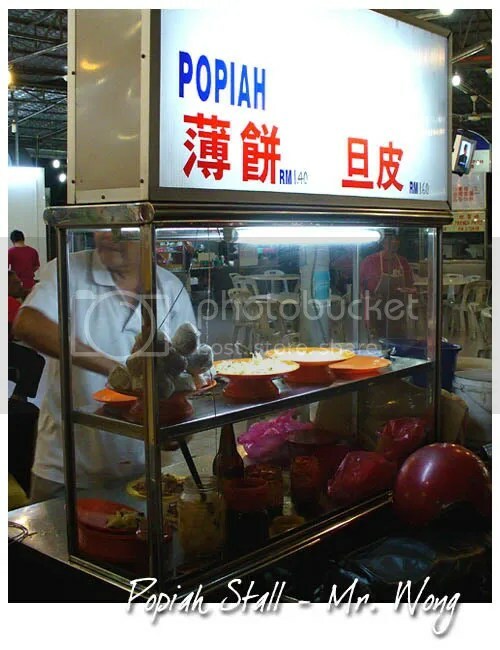 My usual practise will be: pack the popiah and then go over to one of the stalls opposite for my ais kacang! 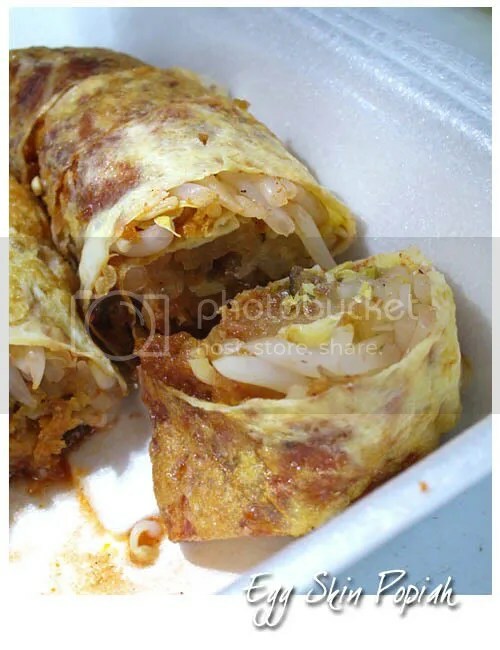 At RM 1.70 per roll, the popiah was still very good; the aromatic egg skin made the overall difference here. Gary love it as he said that he never seen this version before and he packed some back to hotel for his mom. 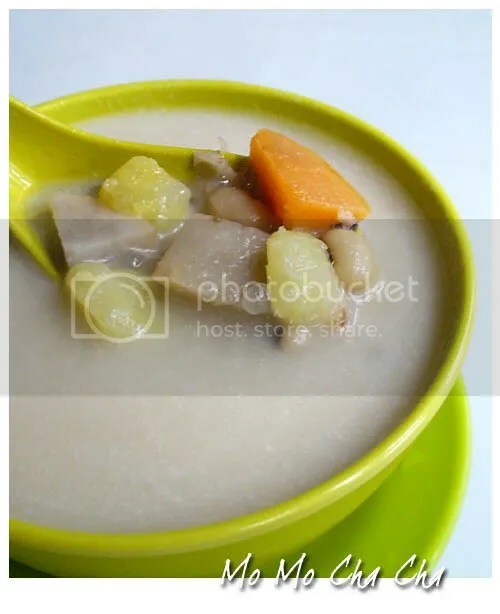 As for tong sui (sweet soup), I usually will go to Stall No. 21 as they serve a wide range of drinks, ais kacang and sweet soup. The proprietor, an auntie and her daughter are very friendly and service was fast too. Me on the other hand, despite having my usual ais kacang, I went for the mixed fruit with shaved ice instead (forgotten the price, should be around RM 4+). 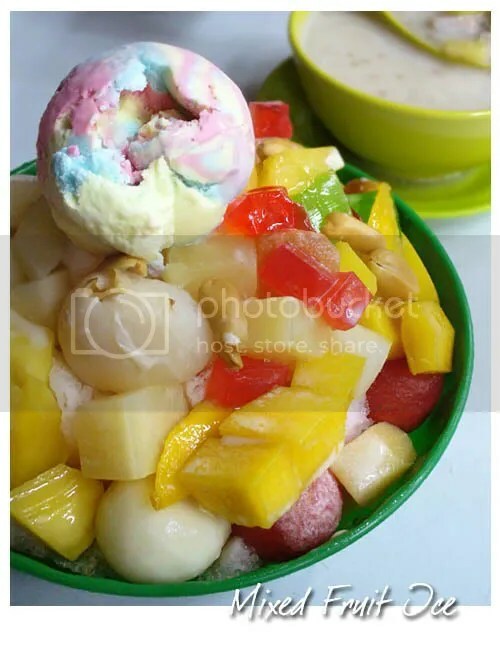 A medley of topical fruits were served on a bed of shaved ice, drizzled with syrup and topped with a scoop of ice cream. The pineapple cubes and lychees can be ignored as they’re canned fruits but the mangoes were fragrant and sweet, as well as the watermelon, honeydew, jackfruit and nata de coco. 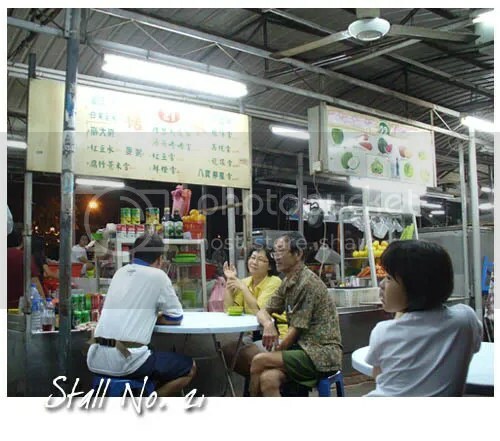 The particular Changkat Thambi Dollah street in Pudu nested much Teo Chew restaurants that serves the usual Teo Chew porridge. Take a walk along the street and you’ll find Dong Bei located at the end of the shophouses. In Chinese, Dong Bei literally means Northern East, which refer to the northern east part of China (Zhongguo Dongbei), geographically bordered from Russia, Korea and Mongolia. The region consists of three provinces of Heilongjiang, Jilin, and Liaoning which also gave it the name of Dongbei Shansheng (Three Northeast Provinces), with Harbin, Changchun and Shenyang are the provincial capitals. 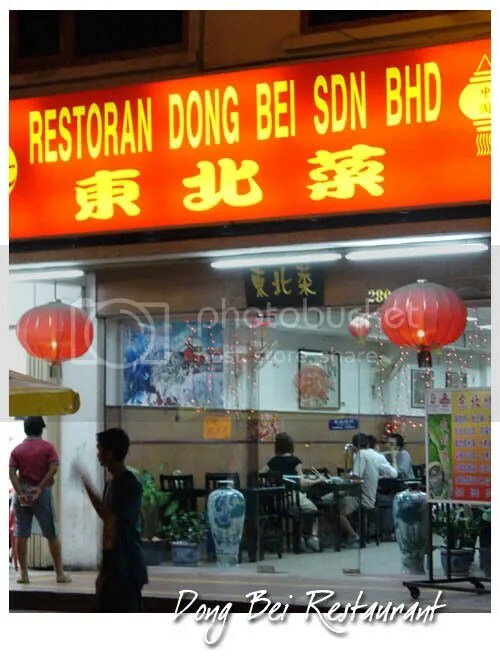 Owned by a Chinese family whom had since migrated to KL, Dong Bei opened its door to the public in 1992 and became the pioneer of authentic Chinese restaurant in Malaysia. Unlike other similar Chinese restaurants in the area, Dong Bei exudes a humble and simplistic aura; dining furniture with typical Chinese decors. No fancy clothed waitress, no artistic dishware. It is advisable to bring along at least one dining companion who can read Chinese as the menu is printed entirely in Chinese and no pictures (!). 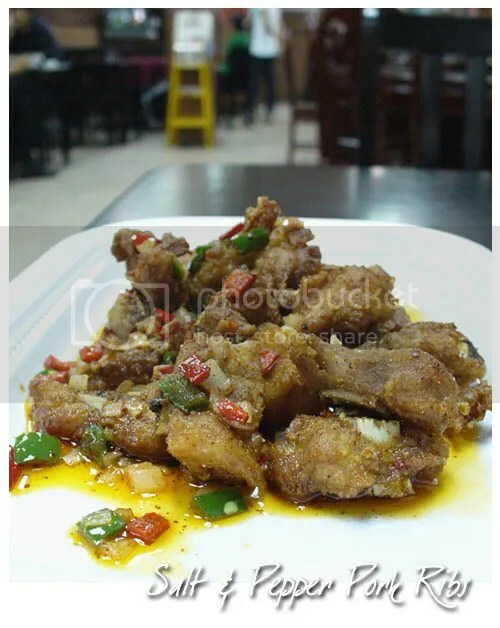 Else, request for the daughter of the owner who can speak a little English for translation or just let her recommend some dishes to you such as this Liang Ban Gan Do Fu. 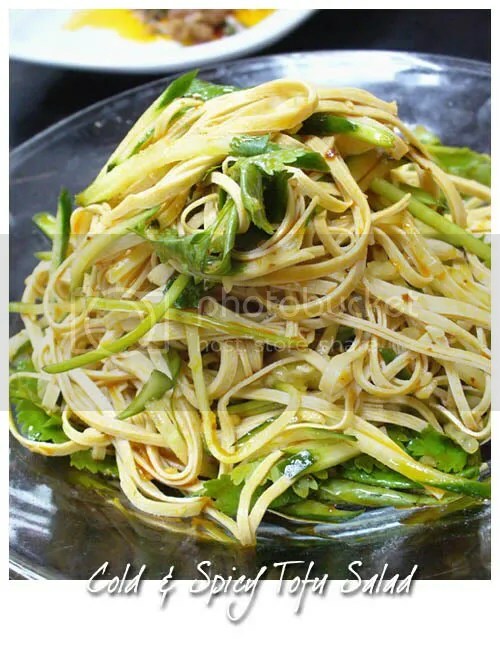 A cold vegetarian dish or salad, it’s made using home made cold beancurd sheet (not available in Malaysia), then sliced into long, thin strips and mixed with coriander, chilli oil, julienned cucumbers and garlic. Despite a bit oily, it makes a good appetizer with cucumber strips gave it a crunchy sensation. 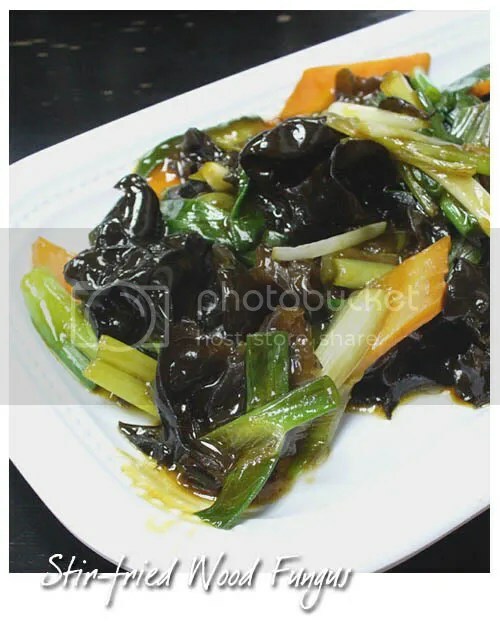 A simple stir-fried wood ear fungus (Chong Shao Mu Er) that uses imported wood ear fungus from China which are thicker and darker than local ones, hence it’s crunchier. I don’t remember if there’s any evidence of wok hei but it’s one of our favourite dish of the night. The pork ribs were smaller than usual but still very delectable. Cooked the salt pepper style (Jiao Yen Xiao Pai Gu), every pieces of the ribs were succulent although a little salty. Perfect to go with white rice. Don’t get freaked out when you saw this dish as the spiciness has been reduced. Served in a large stainless steel bowl (another surprise! 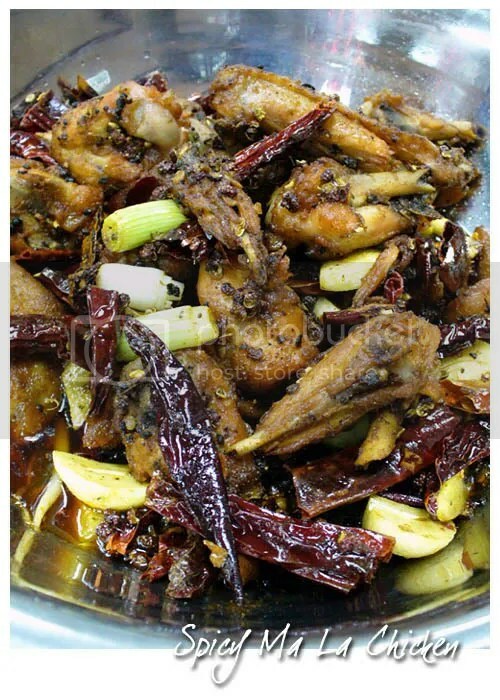 ), the Ma La Chicken (Ma La Ji Chi Guo) portion is definitely meant to be shared. I got to admit, after I’m used to biting in numerous Sichuan peppercorns that were literally wrapping the meat, my tongue can actually feel the citrusy taste of the peppercorns rather than just spicy feeling. Will I be back? Definitely yes as there are many other dishes on the menu I’ve yet to try such as lamb skewers and fish in spicy oil. If you’re an adventurous eater, you won’t be disappointed. But do remember to bring cash as they doesn’t accept credit cards. More reads at Eating Asia and Motormouth From Ipoh.